It’s not just government incentives that have proved a catalyst for biogas expansion; another factor has been the success of intensive arable farming. 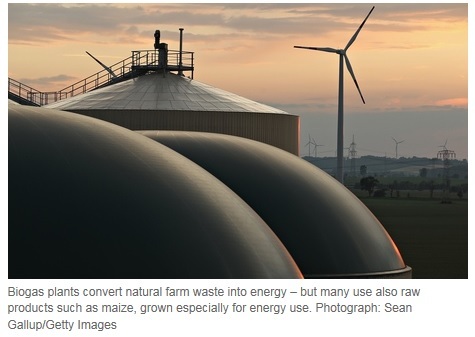 Harnessing the latent energy in decaying organic waste, many biogas plants use so-called “energy crops” such as maize in their processes, since they produce a higher energy yield. But their cultivation also causes soil erosion, and they produce higher carbon emissions than other organic waste. The Farmer’s Guardian claims that maize grown for use in producing biogas energy has trebled to 15,000 hectares farmed in the past two years, and is likely to rise to 25,000 hectares next year. Some are critical of government regulations that exempt maize from practices, such as crop rotation, that limit damage to soil. Friends of the Earth campaigner Kenneth Richter believes the government needs to change its policy. “Maize use should not be encouraged through an exemption in post-harvest soil management under the cross compliance rules,” he says. “Farmers must therefore not be subsidised for feeding biogas plants with feedstock like maize either.”. « Milby AD proposal withdrawn.